It started with a rabbit box. I found a large, cardboard contraption in my driveway the morning of my last final exam of graduate school. RABBIT FEED was printed in official font. When I grabbed hold of it to examine its contents, the box lifted like a lid to uncover a vase of flowers, a box of Junior Mints, and a gift certificate to my local bookstore. A note from friends congratulated me on my finish. To be fair, my purchases that day were novels; one of an autistic boy investigating a dog’s murder and another based on the lives of those in 1970’s New York. But not more than two weeks later I found myself in a PTA thrift store picking up girlie novels for a sick friend when I saw a book on Women. And Religion. Like an addict, I begged my husband for cash. It was only $2, and the cover looked pretty. It was the book I wish I had written, could have written. 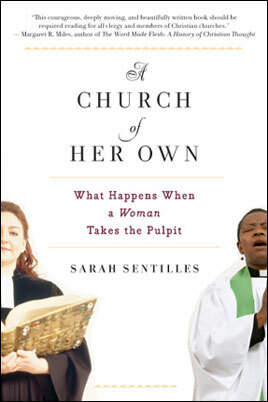 It was Sarah Sentilles’ A Church of Her Own: What Happens When a Woman Takes the Pulpit (Mariner Books, 2008). Part sociological study, part journalistic journey, and part personal plea, it held itself together with dignity and depth despite such diversity. Sarah wanted to be ordained in the Episcopal Church. Well, she thought she did. She went to Harvard Divinity School to receive her M.Div and followed it up with a doctorate. Despite a few stints in parish ministry, she never felt quite at home in an ordination system that seemed more bent on right answers (and anatomy) than right questions. There were stories of lesbian women who not only lost their jobs because of who they loved, but their homes if they were living in parsonages. Stories of women who might not even consider themselves women, transgender individuals who were living in heterosexual marriages when they were first ordained and now inhabit a body with which the church knows not what to do. Stories of women who have started their own churches centered on community, or craft-making. I want Sarah to come to my church. I want her to preach there. I want her to kiss my cheek during communion. I want to see her gummy smile during the passing of the peace. I want it to feel like home to her. Because unless she’s there, unless women and men like her are there, it’s won’t feel like home to me.